Yesterday it was a very sad day for the Portuguese equestrian community. One of the best horses we knew, Coltaire Z, had to be put down after a bad fall at the Portuguese Jumping Championship finals in Lisbon. Coltaire suffered multiple fractures and his owners, Marina Frutuoso de Melo and António Frutuoso de Melo had to let their long time partner go. With Coltaire, Marina won 5 gold medals at the Portuguese Championship and many more at important GP's and Nation Cups - he really was the horse of her life. 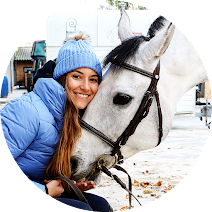 Marina had planned to retire Coltaire, who was 18 years old, from the international competition this year in Aachen. Although Coltaire leaves us more than 1000 sons, he will never be replaced! RIP Coltaire Z!